Mel has been practicing everything ‘yoga’ since her lengthy sojourn in India 15 years ago. While based at the Sivananda ashram in Kerala, Mel not only focused on the postures of yoga but meditation, breath work and every other positive experience yoga has to offer and spontaneously stayed on for her first of many teacher trainings. Mel then continued to train with the likes of Nicole Walsh and Baron Baptiste in the style of Power Yoga; Twee Merrigan in the style of Vinyasa Flow and with Paul Grilley in the form of Yin Yoga, Yin being her real passion. Fusing together all these trainings Mel found a platform to create her own unique teaching style, which is a blend of Western/Traditional Indian and Taoist approaches. 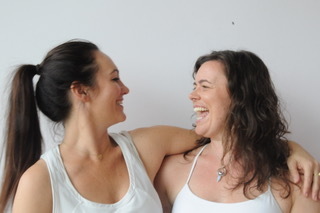 Over the past ten years Mel had been both leading and assisting 200-Hour Teacher Training programs and Art of Alignment modules for ‘BodyMindLife’ and also ‘This is Yoga’ a studio she co-directed and launched, and also her very own ‘The Yin Space’. So it’s with huge personal satisfaction and enthusiasm that now and for the past 2 years, Mel leads her own 100-Hour Yin Yoga Teacher Training to yin enthusiasts. She is an avid student of Paul Grilley and completed 200-Hours training with him in 2013 and ongoing studies which topped off her 10 year love affair with her own personal practice and exploration of yin. With this formal training under her belt Mel had all the tools to create a unique formula for teaching and understanding Yin Yoga. The trainings are designed to give you a deep personal experience of yin (yoga and energy) as well as jam packed with intellectual knowledge and useable tools. A level 3 senior teacher with Yoga Australia gives you the student ongoing PDP and member upgrades when training with Mel. Drawing on her studies of Metaphysics, Acu-energetics, Reiki and other healing modalities Mel’s teachings blends the physical, mental and energetic bodies in regards to yin yoga and teaching in general. An honored ambassador of Lululemon Athletica, she also regularly contributes to Australian Yoga Journal, Women’s health and Women’s fitness magazine’s and various online health and wellbeing sites. She was proud to have co-created and be a founding director of This Is Yoga and currently holds space online at The Yin Space. I came to yoga and coaching in my early twenties. Yoga came first. I was diagnosed with ulcerative colitis and was feeling very low about myself and my life. One of my consultants in my local hospital came to me and said if I wanted to get better I needed to make changes in my lifestyle and he suggested I try yoga. I had always been interested in yoga and so when I was discharged I went to a local community centre in Dublin and signed up. I was hooked! The practice began to change everything for me and I became hungry to learn more. My illness eased and although I wasn’t cured overnight, life became more enjoyable again as I reduced my stress levels and was able to live without chronic pain every day. Life coaching came along a few years later. My parents bought me a course with a wonderful coach, Trudy Arthurs of Dancing Leopards. I spent 3 months working with her to discover I wanted more from my life and I was committed to making it happen. During this time my professional career in PR was taking off. I was working with big brand clients in Ireland building their profiles, organising events & roadshows across the country and interacting with media on a daily basis. I made a choice to travel and take some time out and in 2005 I left Ireland for Asia & Australia. It was while I was living in Australia and working in PR when I came to Power Vinyasa Yoga. What I loved about the Baptiste method was the transformational coaching that was a part of the practice. During my years practicing I fell more and more in love with yoga and I knew I wanted to train as an instructor. In 2008 I moved back to the UK and began my yoga teacher training with Yogacampus in London, UK. Since that initial training I have completed intensives with Baron Baptiste and Shiva Rea. I have most recently certified as a Forrest Yoga Instructor with Forrest Yoga Creatrix, Ana Forrest and teach Forrest Yoga; Power Vinyasa Yoga & a Yin / Yang Yoga practice. I teach at various Dublin & London studios – INIT Yoga Dublin; My Yoga Body Dublin; Indaba Yoga; Triyoga UK; Lumi Power Yoga; Blue Cow Yoga & Virgin Active and I have had the privilege of sharing yoga in Holland, Spain and Canada. My approach is one of dedication and intention with an element of lightheartedness. In 2012 I left my PR agency life for a role with lululemon athletica as their Community Connector for the UK & Ireland. Working with a company passionate about vision & goal setting and leadership development, I began my training as a life coach. I am passionate about individual growth and development and I believe in the power of vulnerability. Being vulnerable is to be authentic and my intention is to provide space for people to open up and to listen. In 2013 I trained with The Animas Institute and I now work as a Yoga Instructor, a Life Coach for individuals & a PR & Strategy Consultant for small businesses in the yoga & well-being industry. My commitment is to inspire people to live their best life through the practices of yoga and coaching.